One of the many tools in the estate planning toolbox is the ‘per stirpes’ designation. Hailing from the Latin language, per stirpes means “by branch” and in relation to a family tree, each branch represents a family. Think of a family with two siblings. Each of those sibling’s families represents a branch. Example A show us how assets pass to beneficiaries without the per stirpes designation and with both beneficiaries still living. This is the most straightforward and commonly used designation. 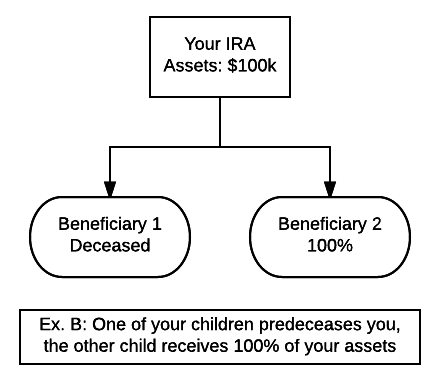 However, as Example B highlights, that same designation effectively cuts out Beneficiary 1’s family if Beneficiary 1 predeceases the IRA owner. 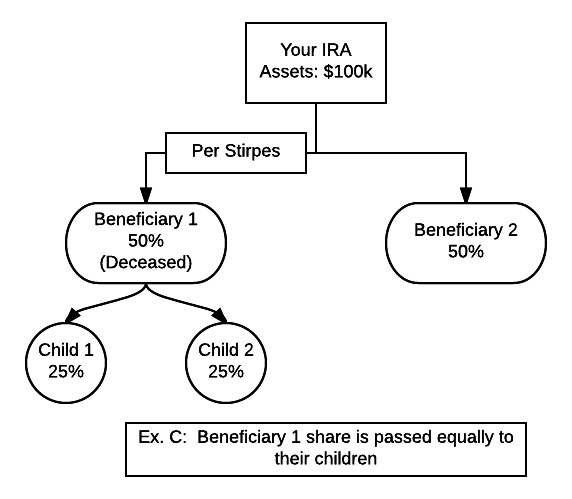 Example C shows the same IRA assets still split between your two beneficiaries, but the deceased beneficiary’s assets pass equally to their children. Used correctly, per stirpes can simply your estate planning and secure your assets for your beneficiaries’ descendants. However, since per stirpes is a legal term, it’s meaning can be misconstrued if not worded correctly. Even the large brokerage firms such as Charles Schwab will point out on their beneficiary designation form, that their “definition of the term ‘per stirpes’ may differ from the definition of per stirpes under your state’s law and/or your will or trust.” With that in mind, we recommend talking with an estate planning attorney before adding per stirpes to any legal documents to make sure it works the way you intend it.